A natural athlete who outplayed boys during her All-State high school days, she became a trail-blazer for women’s sports in the U. S. “Blaze” ended her four-year (1974-1978) career at Montclair (N. J.) State as the leading scorer in women’s Division I college basketball history, scoring 3,199 points (31.7 career average per game). She scored 52 points in a game played at Madison Square Garden-still a single-game record for that venue-when Montclair State beat Queens College, 102-91. 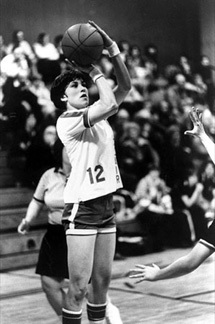 Her awards and achievements were many including Collegiate Player of the Year in 1978, first team All-American three straight years, captain of the U. S. Women’s Olympic Basketball Team in 1980 (the year the U. S. boycotted the Games in Moscow), and MVP and scoring title honors in the professional ranks. She was elected to the Basketball Hall of Fame in 1994. 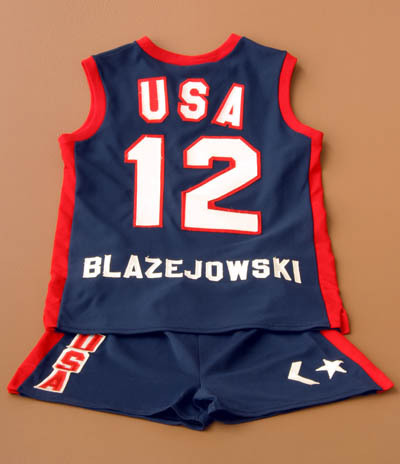 No one in the history of sports has ever had a more fitting nickname than Carol “Blaze” Blazejowski. Her extraordinary athletic talent, relentless determination, and uncompromising work ethic made her one of the brightest stars in the history of women’s basketball and a trailblazer for women’s sports in this country. Blaze is the leading scorer in women’s Division I college basketball history, having tallied 3,199 points during her remarkable career at Montclair College in New Jersey from 1974 to 1978. No other woman has ever surpassed that mark, and just three men (Pete Maravich, Freeman Williams and Lionel Simmons) have ever scored more. But Carol did more than put the ball in the basket. She was a superb all-around talent, a team-oriented player skilled in all facets of the game. Her awards and achievements were many, including collegiate women’s basketball player of the year honors, first team All-America selection for three straight seasons, captaincy of the U.S. Women’s Olympic Basketball Team, and the Most Valuable Player honors and the scoring title in the women’s professional league. In 1994 she was inducted into the National Basketball Hall of Fame in Springfield, Massachusetts. As a senior Carol led Cranford High School’s first varsity girls’ basketball team to 19 straight wins and a berth in the state finals. Blaze averaged 31.4 points and 17 rebounds a game and earned All-State recognition. Carol moved on to Montclair State in 1974. As a freshman, she averaged “just” 19.9 points a game, hitting 43 percent of her shots from the field. As a sophomore, she averaged 28.5 points, and earned her first of three straight All-America selections. She improved her scoring average to 34 points a game as a junior, and then to 38.8 as a senior, and led the nation in scoring both years. After her freshman season, she never shot less than 55 percent from the field. The single game that Carol is probably best remembered for took place on March 6, 1978, in New York’s Madison Square Garden. Montclair State played Queens College before 12,336 fans and hoards of national media. Despite being in foul trouble, Blaze played the entire second half and made an incredible 17 of 21 field goal attempts. She finished with 52 points, a single-game collegiate scoring record for that venue which still stands. Montclair State won the game, 102-91, and women’s college basketball was propelled into the national spotlight. Later that year Blaze led Montclair State to the AIAW Final Four. Despite Carol’s 40 points, Montclair State lost in the semi-finals to eventual champion UCLA. When Carol ended her collegiate career in 1978 she had scored 3,199 points for an average of 31.7 points per game. Both were Women’s Division I College Basketball records. In her senior year she also set the women’s single season record of 1,235 points (38.6 ppg). Over her career she shot an amazing 54 percent from the field, and 79 percent from the free throw line. Blaze also averaged 10.4 rebounds a game. Carol picked up a variety of honors during her amazing career. She was a three-time All-America selection (1976, 1977 and 1978), was named the Converse Women’s Player of the Year Award recipient in 1977, and was the first-ever recipient of the Wade Trophy as women’s basketball player of the year in 1978. The rise in popularity of women’s basketball led to the creation of the Women’s Basketball League in 1978, but Carol decided to instead pursue her dream of winning Olympic gold. After college she played in various international competitions, helping U.S. squads win gold medals in the World University Games, the World Championships, and the R. William Jones Cup in 1979. When tryouts were held for the 1980 team Carol not only made the squad, but was named captain as well. Unfortunately, the U.S. decided to boycott the Moscow Games and Carol’s Olympic dream remained unfulfilled. Blaze then turned pro with the New Jersey franchise in the WBL for the 1980-81 season and led the Gems into the playoffs for the first time. She was the circuit’s top scorer with 1,067 points (29.6 ppg. ), an All-Star and was named league MVP. The financially troubled WBL folded shortly afterwards and Carol moved on to other endeavors. Carol became involved with various projects, most of which involved basketball. They included Blaze’s Eastern Basketball Camp for 10- to 17-year-old girls, which she owned, managed and directed. She has held front-office positions with the National Basketball Association and the New York Liberty of the WNBA. It’s been over two decade since Carol Blazejowski occupied center stage on the national sports scene, but her name remains emblazoned indelibly in the annals of women’s college basketball. The most points ever scored in Women’s Division I basketball history with 3,199 career points and a 31.7 game average (1974-78). The most points ever scored during a single season in Women’s Basketball’s with 1,235 points and a 38.6 per game average in 1978. The single game collegiate scoring record (52) at Madison Square Garden. The Converse Women’s Player of the Year (1977). The first ever recipient of the Wade Trophy as Women’s Basketball Player of the Year (1978). The Women’s Basketball League 1980-81 scoring championship with 1,067 points, and All-Star and Most Valuable Player honors.